A Brit I knew has worked all his life for the Salvation Army, which has a policy of moving their senior staff to a different location in the United Kingdom every 3 years to inject new ideas and perspectives into their branch offices. On his 40th birthday, he woke up with a horrid realization that he did not even own the cutlery he was using for breakfast in the fully furnished home the charity has rented for him. Indeed the human need for touchable tangibles as signifiers of home is undisputable. Even IKEA acknowledges that in its ultra cool revamp of their brand identity: their 2017 catalogue in a revolutionary lifestyle magazine format carries stories of how individuals live in and use their IKEA furnished homes; with one about IKEA furniture that the nomadic individual happily owns and hence can easily pack up for moving with him to his next destination on the planet. As consequently it is highly comprehensible that Filipino artists Alfredo and Isabel Aquilizan have seized on their recent collaboration with STPI to make permanently physical a good number of their previous and ongoing series of temporal installations that have arisen from invitations to artistic opportunities across the globe; innovatively using print and paper making technologies to create aesthetically astounding 2 and 3 dimensional artworks that perfectly redress the inadequacies of just having photographs as keepsakes of their transient works of art. Their current “Of Fragments & Impressions” exhibition at STPI thus takes to an infinitely higher plane their usual artistic oeuvre of exploring their own concepts of home and identity wrought by a time of studies in Britain and by making Brisbane, Australia their artistic base, and of discovering those held by distinct groups populating different parts of the world. The displayed “Northwind” and “Vessel After the Crossing: Project Another Country” series here give permanence to Alfredo’s realization while in the UK doing his Masters and while in Brisbane working on his PhD that his identity is as much rooted in his love for Isabel, who had remained in the Philippines expecting their first child in the 1990s, as it is on the belongings that had filled his Australian studio. These aspects are as pertinent to the waves of Chinese, Japanese, Koreans and finally Filipinos that had arrived in Hawaii as sugar plantation workers between the 1850s and 1930s in birthing Hawaiian Pidgin, a hybrid of the Hawaiian, English, Japanese, Chinese and Portuguese tongues. And raises the question whether the 1st people who had made landfall in New Zealand from Polynesia over 700 years ago had similarly defined themselves back then too. Perpetuity is likewise given by the series “Dwellings After In-Habit: Project Another Country” and “Fragments After In-Habit: Project Another Country” to the plight of nomadic Badjao tribes who make the seas coasting the Philippines their home; of their children resorting to living on land fringing metropolitan centers to beg as high tech fishing trawlers and dynamic fishing by land-based Filipinos have so drastically reduced the ocean’s fish populations, the Badjao’s traditional fishing methods can no longer be their cherished means to earning a living. What then is its impact on their identity? And that of what is home? And how does this translate to all Filipinos living for years and years wherever work has taken them away from the Philippines? When all the utilitarian and sentimentally valued belongings they can take with them abroad are dictated by the weight and size of the cardboard ‘repatriation’ box they use? When those very measurements similarly restrict what they can bring back with them when it is at last time to return home? Besides, what will all returning migrants be bringing conceptually back upon returning to their homelands? What effects will that have to these countries? The Aquilizans’ “Left Wing” series enduringly raises to consciousness the real impact imported communist ideology has had on the historical development of the Philippines during American colonial rule, of Indonesia under President Sukarno’s reign, of Taiwan when the Japanese had controlled the territory, of Vietnam while under French colonial rule and of unfortunate Cambodia under the left-wing Khmer Rouge. 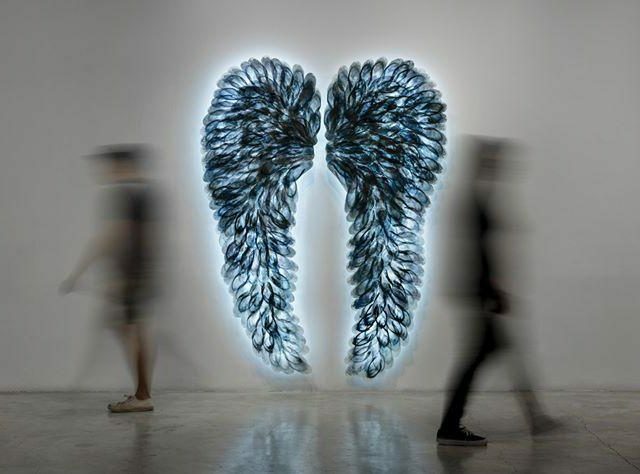 By juxtaposing their “Flight” and “Wings” series against that of “Left Wing”, the Filipino duo concurrently sets in stone an awareness that even those who have never left their homeland can face an identity crisis – when either willful, unwitting or even desperate measures have landed residents in Singapore in its Correctional Facility. How will this center’s programmes of hopeful promise of redemption redefine who they become? How will they then see themselves? How will family and home perceive them? How will they now regard the garden city – their homeland? Alfredo & Isabel’s “Wood / Cut” series holds out more than a glimmer of hope: as all the imported roadside trees have adapted well to Singapore’s climatic and ecological conditions, why would not this nation’s waves after waves of immigrants over the last 200 years? And through the course of time the newbies would develop enough homeland history in the lion city to whole heartedly embrace its distinctiveness already deeply entrenched within the present day descendants of early settlers who had arrived shortly after 1819. Then there will be unity in the Singapore concept of home and identity inscribed on the solidly packed ‘repatriation’ cardboard box pulped houses set on even more solid wall-mounted metal stilts in the final series the Aquilizans have cast in dye at STPI – “Home: Project Another Country”. For why else would recent emigrants move to Singapore if not for finding highly attractive what its early settlers and their descendants have already preciously shaped the nation and themselves into in all manner of the word? And is it not this very appeal they thus want for themselves and their children and grandchildren too that have inspired them to once and for all uproot and move? Without a doubt, Alfredo & Isabel Aquilizan’s “Of Fragments & Impressions” exhibition cornerstones the foundations in building soundly stable national, familial and personal identities – ones made even more crucial in the present day and age of rapid and constant massive influx and efflux of people across national boundaries on a global scale. Join this highly complex debate while “Of Fragments & Impressions” runs at STPI, 41 Robertson Quay, Singapore 238236 till 11 November.